SUP ATX Keel Fin | Color: Black | Length: 7.5" | FREE SHIPPING! 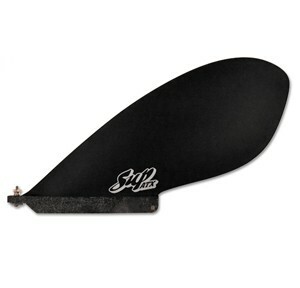 This is a great flatwater fin for almost any SUP board. The lo-profile swept back design makes this fin great for shallower waters and also for cutting through debris in the water. Fin installation is very simple with our "SUP Screw" fin installation kit that comes with all our fins. No tools required! Free Shipping in Continental US. Watch our SUP Screw Installation Video. This is a great flatwater fin for almost any SUP board. The lo-profile swept back design makes this fin great for shallower waters and also for cutting through debris in the water. Fin installation is very simple with our "SUP Screw" fin installation kit that comes with all our fins. No tools required! Free Shipping in Continental US. Includes SUP Bolt mounting kit for easy installation - works with most all SUP boards.